In lightning-paced French, the woman asked us if we would like some of her beautiful grapes. As she ran behind her fence to procure a knife and a bag, I mumbled to Shawn that I thought she’d mentioned that she’d been to the dentist earlier in the day, and was experiencing that all-too-universal discomfort following her visit. I thought I’d also heard something about her having been a French teacher in the village for decades. Running back past her yippy dog who wasn’t at all happy at our being in front of his domain’s gate, the woman exclaimed, “Quelle chance – what luck – to meet young people from the United States who speak French! I used to be a French teacher,” she added. We learned that her name was Violetta. With her dog continuing to bark enthusiastically, Violetta sawed away at the grapes’ branches, eventually stuffing a plastic bag with 2 kg. (more than 4 pounds) of grapes. Closing the gate, and feeling quite satisfied with her harvesting prowess, Violetta chatted with us further. We learned that she was the former teacher of our guesthouse host, Constantin, and that many of her neighbors had gone to work abroad. We then asked Violetta if we could take a photograph together to commemorate our chance meeting. We all wanted a souvenir photo to remember the moment, but what to do? Unfortunately, we would be leaving the next day. Standing in the sun’s warm rays, I had an idea. Pulling out a fat clump of grapes, I pretended as though I was gobbling it – perhaps that I was on a safari in a vineyard? The silliness worked, for in a second Violetta too was donning a grape mustache, concealing any dental discomfort, and hamming it up for the camera. With that gesture having primed the pump, our impromptu photo session continued, and at Violetta’s insistence, she also had a photo shoot with Shawn. Leaving her vocal pup to continue crooning at her home front, the three of us walked off into the sunset, with Shawn carrying the bag overflowing with the grapes that brought the three of us together. 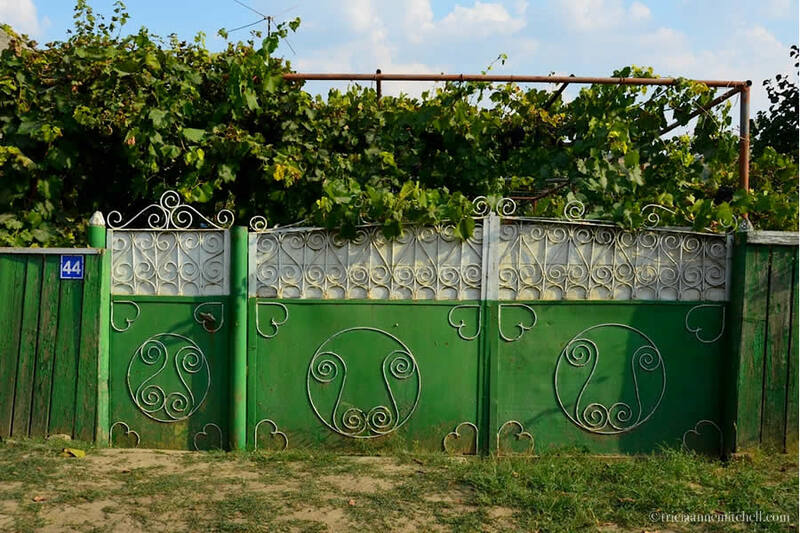 Moldova’s gates and fences have style. The most popular colors in the village of Rosu seem to be green, blue, and white. Tempting clusters of grapes hanging on an arbor in a home’s courtyard. Beautiful woodwork on a home’s gable. I’ve seen all kinds of flourishes, plus depictions of roosters and horses on Moldova’s village homes. 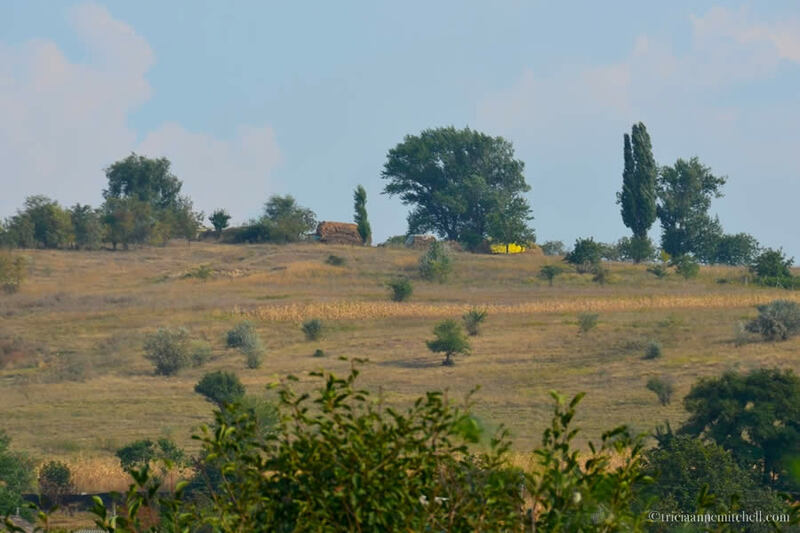 The countryside surrounding the village of Rosu, just 5 km. from Moldova’s third-largest city, Cahul. 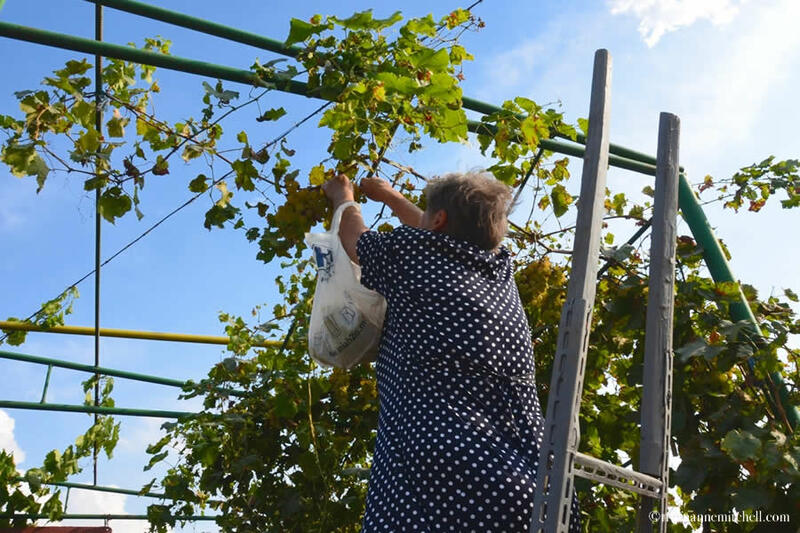 Wielding a knife, and sporting a spunky spirit, Violetta braves her ladder to cut us a few bunches of grapes. 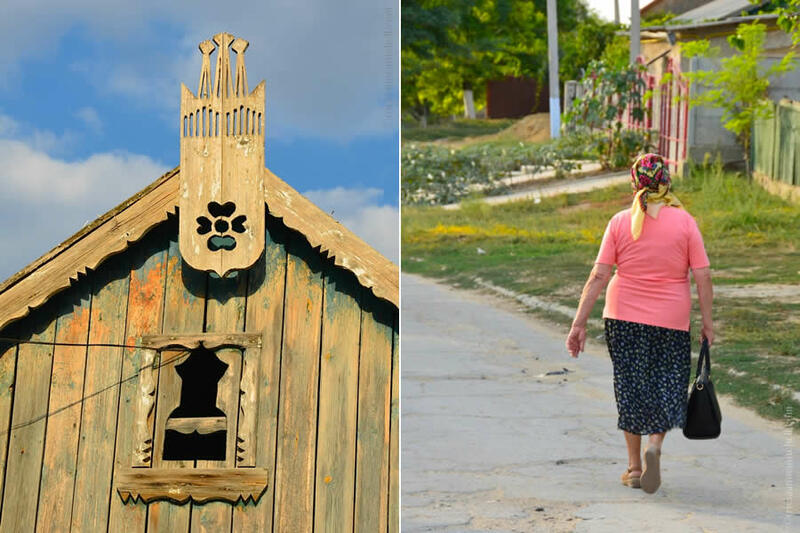 Moldova’s homes flash charming folk-art motifs. 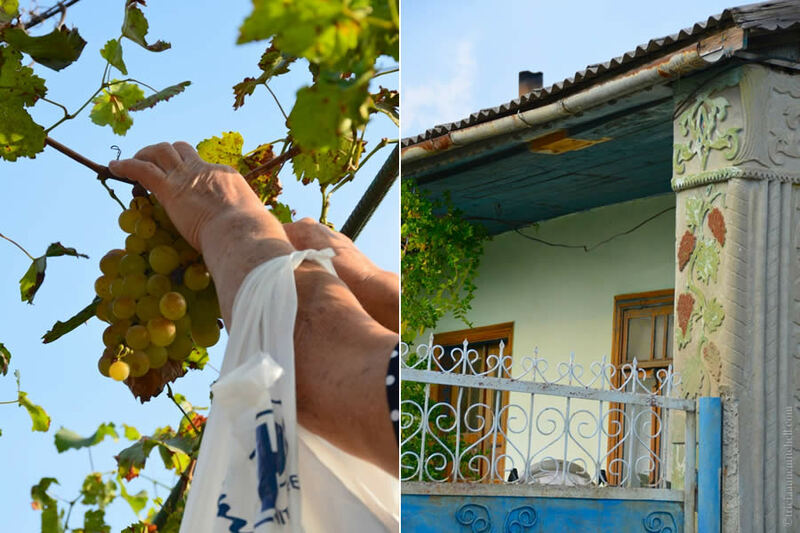 Here, depictions of grapes on a home’s exterior pay homage to Moldova’s impressive wine culture. From amateur winemakers in villages to commercial wineries whose wines have won international awards, the country has long been known for its quality production. Violetta and me, hamming it up for the camera. Shawn, Violetta, and those scrumptious grapes. We feasted on them after our spontaneous early-evening stroll with Violetta. The village of Rosu is located about 5 km. (3 miles) from the city of Cahul, Moldova’s third-largest city. 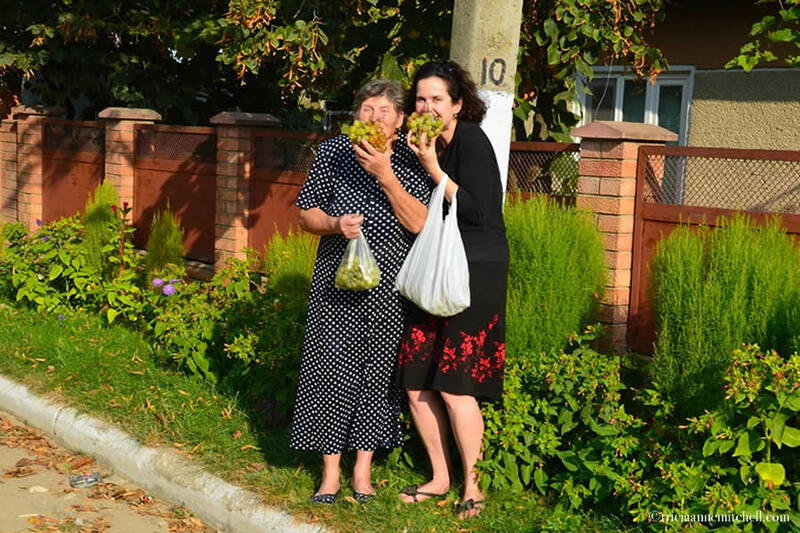 Not far from the Romanian border, and on the travel circuit between Bucharest, Romania and Chisinau, Moldova, the village is a convenient stopping point and introduction to village life in Moldova. During our time in Rosu, we were fortunate to have discovered the CostelHostel Guesthouse, founded by Constantin, who was born and raised in the village. He has a super command of English (he’s self-taught!) and speaks his native Moldovan-Romanian, plus Russian and Italian. Constantin was eager to walk us through his village, show us how to cook traditional Moldovan dishes, and share tidbits about Moldovan culture. 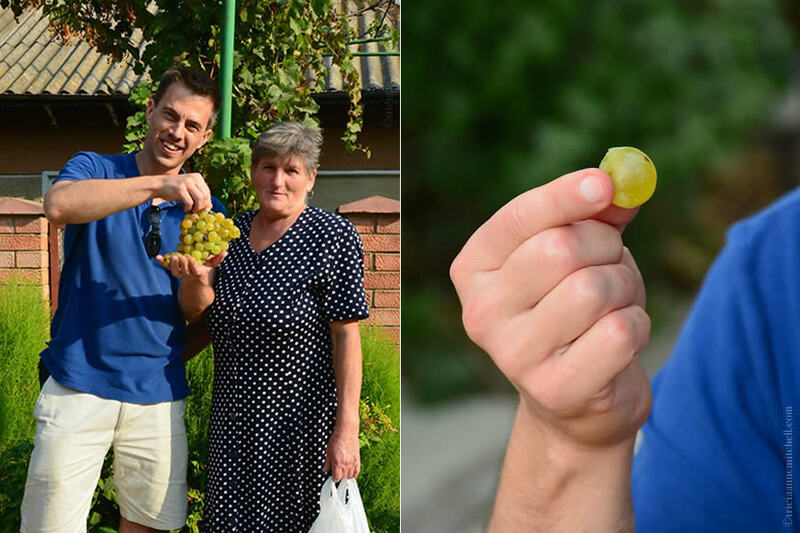 We also participated in the grape harvest with his neighbors, and highly recommend an autumn visit to the region! To view bus routes throughout the country, as well as schedules, visit the following transportation website (in Romanian-Moldovan). Need more inspiration? This link contains an index of all my posts from Moldova. I just love this! What a nice experience that makes traveling so special. Reminds me of some of the things I experienced in southeaster Moravia (which you probably know is also wine country). Jenna, it is these moments that are the most memorable when I think back to our travel adventures! We’re contemplating heading back through the Czech Republic on our overland journey to Germany. The city of Brno might be on the way, and I remember you writing that you had spent some time in Moravia. I’ll have to review your post, to see if Brno’s covered. I’d love to spend an extended amount of time in Moravian villages too, but the weather’s getting pretty chilly over here and we don’t have the right weather gear. :) Thanks for your comment, and happy weekend! Your description from beginning to end is just magical… “the gingerbread homes of the Moldovan village, Rosu, were bathed in golden hues” makes me feel as if I’ve been sitting on an old bench watching these beautiful scenes of the village for the past century, and of course with a glass of the local wine in hand. Moments like the one you had with the old woman is just a perfect description on the great thing travel can bring. Incredible shots, as always ~ a mirror into these places you’ve been. Dalo, ah, than you for such kudos. :) Indeed, vintage wooden benches are positioned in front of many of these charming homes, and you’d be in good company with the many locals who sit upon them and watch the world go by. The wine culture is quite something here. 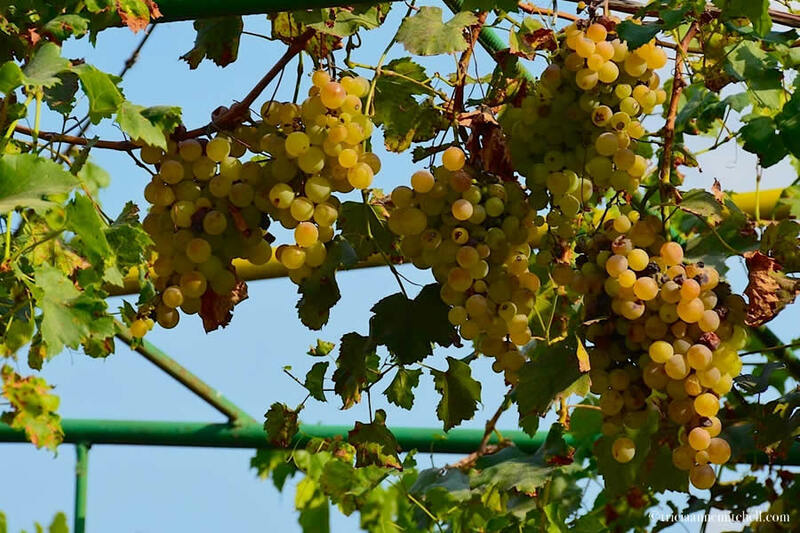 You’ll see grape motifs on fences, on the façades of homes, and the wine-industry officials also like to point out that Moldova itself is shaped like a cluster of grapes. When you peek at the map, I suspect you’ll agree! Thank you for sharing such a lovely comment! You’re back in Asia now, following your Pacific NW adventures? I suspect much of our liking for places is because we come across such generous people on out travels who present us with an unforgettable peek beneath the surface of their countries. Presents of oranges, warm from the sun and newly picked from a tree, pieces of fruit, special plates of a delicacy or an on-the-house glass of brandy because its a birthday or anniversary celebration, all provide lingering memories we cherish. Dorothy, I couldn’t agree with you more, and I wonder if you were the recipient of that sun-kissed orange, or perhaps the brandy? When I meet such welcoming souls, I often find myself pondering if I’m a kind enough place ambassador to visitors to my home? We haven’t technically had a home in a long time (going on 3 years), but I do hope to reciprocate someday. Good thing the French came in handy! Are there any popular or common languages spoken by most Eastern Europeans? It sure did, Bespoke Traveler, making me tip my hat to my high school French teachers. :) Common languages, you ask? From personal experience, we’ve encountered a fair number of German and Russian speakers, particularly among the older populations. We’re finding that the younger people often speak English. Look at all those gorgeous grapes! Love the picture of you and Violetta — so cute! Neely, sometimes mischief pays off. :-) And yes, the grapes are photogenic beauties. I was especially drawn to the white ones (I believe they were the Fetească Albă variety) because the of their complex colors (muted greens, a bit of yellow, and even a hint of smoky lavender). Coupled with the autumnal hues of the changing trees, they make the landscape come alive. Excellent photos of a fascinating place! I love the adornments on the buildings, and the grapes look luscious! Hi Marilyn, as they say in Moldova, mulţumesc – thank you. Something that wine or folk-art lovers would appreciate is the variety of the adornments. From clusters of grapes, to roosters, to trumpeters, it’s fun to see what the artisan has done to embellish a home.